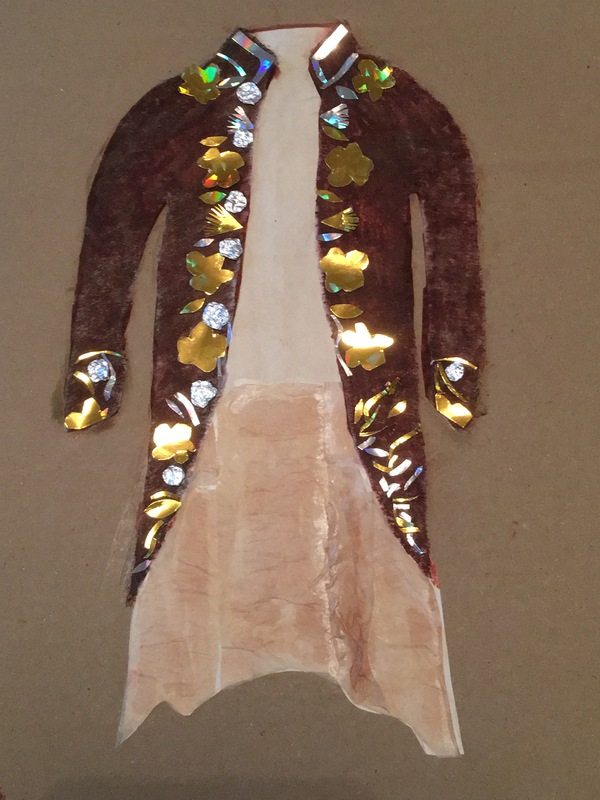 I chose a brown cardboard as the base of my collage of the coat. I felt it suggested the weight of the fabric I then chose to draw a simplified shape of the coat and then layered a paper cloth that I coloured with felt tip. As it dried it started to show the square pattern through the colour so I added another layer this time using a dried wipe which I coloured with pastels. I think this effectively portrayed the felt texture of the coat. The silk lining was a first layer of cartridge paper stained with a tea bag to give it a yellowy aged look and then an additional layer of tissue paper also coloured using tea to give the impression of the fold and creases in the coat tails. As a contrast and to portray the vividness of the embroidery against the brown coat I used tiny pieces of holographic paper that I cut into shapes. A Tunnock’s teacake wrapper rolled and moulded provided me with the ornamental buttons. My second collage started with me layering 3 sheets of cartridge paper. I did this to portray the weight, layers and folds of the shawl. The top sheet was again coloured using tea bags to more accurately create the yellow aged characteristics of the shawl. 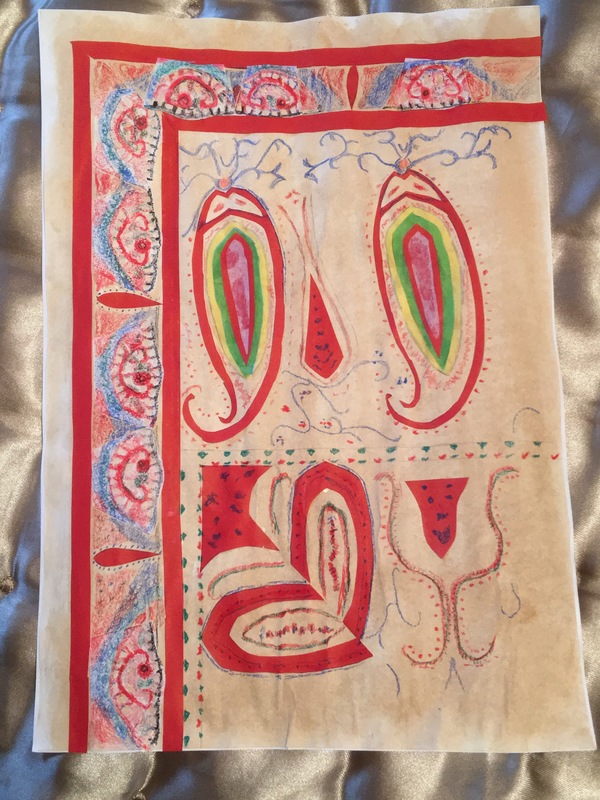 I then used lots of carefully cut out pieces of an old envelope and coloured tissue paper to build up some of the detail in the intricate Paisley pattern design. I used small sections of a paper doily to convey some of the teardrop shapes on the edge pattern. I used watercolour pastels to colour these sections. My placement is not entirely accurate but was more to give an impression of the design. I found this intricate work to be quite absorbing but time consuming much to the dismay of my starving family!